NOTES: Skymate came packaged with one of the 1991 GI Joe Air Commandos Gliders. 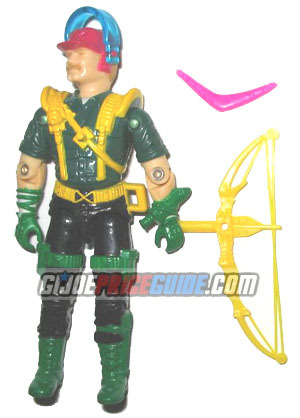 Skymate and his fellow GI Joe Air Commando, Cloudburst, are more expensive loose than their Cobra Air Commandos counterparts because of their easily lost visors. The Australian born Skymate also has a small pink boomerang that is often misplaced.